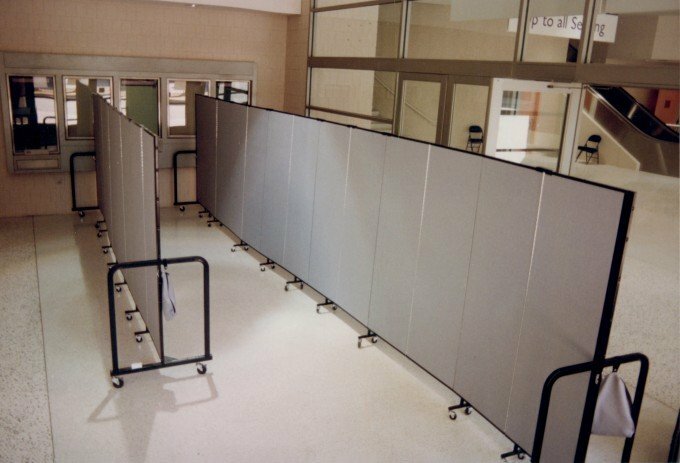 Uses: Corporate, Crowd Control, Hospitality, Other Markets Colors: Gray/White Lengths: 13 panel 24'-1" Heights: 6'-0"
When tickets for three different events went on sale simultaneously at this venue the ticket manager simply used two portable dividers to create three separate lines to maintain crowd control. Guests were directed to stand in the aisle according to the event they were interested in attending. When the ticket sale was complete, the dividers were rolled to another area in the coliseum to direct guests to the private elevators towards the box seats. More organization meant less confusion.